Doha, 22 June – The World Heritage Committee, meeting in Doha (Qatar) under the Chair of Sheikha Al Mayassa Bint Hamad Bin Khalifa Al Thani, this morning inscribed four cultural sites in the Republic of Korea, China, and India on the World Heritage List, as well as a section of the Silk Roads network, submitted by Kyrgyzstan, China and Kazakhstan. Namhansanseong (Republic of Korea) was designed as an emergency capital for the Joson Dynasty (1392-1910) , in a mountainous site 25 kilometres south-east of Seoul. Built and defended by Buddhist monk-soldiers, it could accommodate 4,000 people and fulfilled important administrative and military functions. Its earliest remains date from the 7th century, but it was rebuilt several times, notably in the early 17th century in anticipation of an attack from the Sino-Manchu Qing dynasty. The city embodies a synthesis of the defensive military engineering concepts of the period, based on Chinese and Japanese influences, and changes in the art of fortification following the introduction from the West of weapons using gunpowder. A city that has always been inhabited, and which was the provincial capital over a long period, it contains evidence of a variety of military, civil and religious and has become a symbol of Korean sovereignty. The Grand Canal (China) is a vast waterway system in the north-eastern and central-eastern plains of China, running from Beijing in the north to Zhejiang province in the south. Constructed in sections from the 5th century B.C. onwards, it was conceived as a unified means of communication for the Empire for the first time in the 7th century A.D (Sui Dynasty). This led to a series of gigantic worksites, creating the world’s largest and most extensive civil engineering project prior to the Industrial Revolution. It formed the backbone of the Empire’s inland communication system, transporting grain and strategic raw materials, and supplying rice to feed the population. By the 13th century it consisted of more than 2,000 kilometres of artificial waterways, linking five of China’s most important river basins. It has played an important role in ensuring the country’s economic prosperity and stability and continues today as a major means of internal communication. Silk Roads: the Routes Network of Chang'an-Tianshan Corridor (China, Kazakhstan, Kyrgyzstan) is a 5,000 kilometre section of the extensive Silk Roads network, stretching from Chang’an/Luoyang, the central capital of China in the Han and Tang Dynasties, to the Zhetysu Region of Central Asia. It took shape between the 2nd century BC and 1st century AD and remained in use until the 16th century, linking multiple civilizations, and facilitating far-reaching exchanges of activities in trade, religious beliefs, scientific knowledge, technological innovation, cultural practices and the arts. The 33 components included in the routes network include capital cities and palace complexes of various empires and Khan kingdoms, trading settlements, Buddhist cave temples, ancient paths, posthouses, passes, beacon towers, sections of The Great Wall, fortifications, tombs and religious buildings. Rani-ki-Vav (the Queen’s Stepwell) at Patan, Gujarat (India) is located on the banks of the Saraswati River and was initially built as a memorial to a king in the 11th century AD. Stepwells are a distinctive form of subterranean water resource and storage systems on the Indian subcontinent, and have been constructed since the 3rd millennium BC. They evolved over time from what was basically a pit in sandy soil towards elaborate multi-storey works of art and architecture. Rani-ki-Vav was built at the height of craftsmens’ ability in stepwell construction and the Maru-Gurjara architectural style, reflecting mastery of this complex technique and great beauty of detail and proportions. Designed as an inverted temple highlighting the sanctity of water, it is divided into seven levels of stairs with sculptural panels of high artistic quality; more than 500 principle sculptures and over a thousand minor ones combine religious, mythological and secular imagery, often referencing literary works. The fourth level is the deepest and leads into a rectangular tank of 9.5 by 9.4 metres, at a depth of 23 metres. The well is located at the westernmost end of the property and consists of a shaft, 10 metres in diameter and 30 metres deep. With this morning’s inscriptions, the total number of sites on the World Heritage List has climbed to 992. 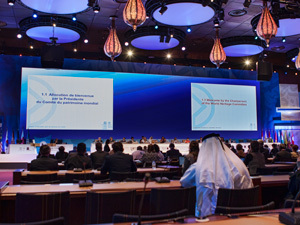 The 38th session of the World Heritage Committee began on 15 June and will continue through to 25 June.